We continue our quest through the history of the computer scientists that change the world. 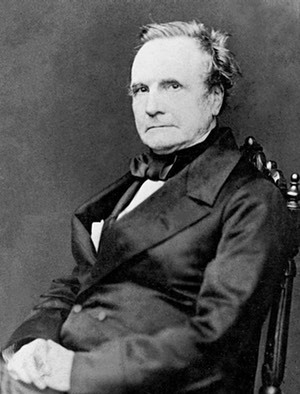 Although we move in a non-chronological order, it’s time to talk about the person who actually created the very first kind of computer – Charles Babbage. Born in 1791, he was an English mathematician, analytical philosopher, mechanical engineer and computer scientist through his life until his death in 1871. He knew it was a lot of errors in calculating advanced mathematic tables, and wanted to erase this risk for crucial mistakes. He wanted to make the tables calculated mechanically, so that the human errors would not be a problem. But this was not as easy as it may seem to us today. Back then, however, it was very much dislike and setbacks for him. Mainly three factors seemed to have influenced him – disklike of untidiness, his experience working on logarithmic tables, and the existing work on calculating machines. The calculating machines was carried out by Gottfried Leibniz, who talked about the principles of a calculating machine in a letter to Sir Humphrey Davy in 1822. Babbage created an engine that was the first ever mechanical computer. He realised that a machine could do a much better and reliably work than the humans ever could. This idea made him eager to build the machine, but he never got the chance to finish it. Unfortunately he had to stop the building in an early stage, as he did not have enough money to finish it. The machine that he managed to create, however, was steam-powered and clumsy, but they more or less did their job. The machines were organised in a way that much resembled the way our modern computers is built, so he was very much before his time with the machines. He built it so the data and memory was separated from each other, the operation was instruction based, the machine had a separate I/O unit and the control unit could make conditional jumps. So in many ways, it was a computer. I’d like to finish this post with a fun fact, or rather a recommendation. If you are aver to visit London, try to get a peak in to the Science Museum. Here you will find the original brain of Charles Babbage, in a jar on the exhibit. It may seem a bit scary, but it’s definitely worth seeing if you are interested in computer science, and/or history.